You are here: Home / corn dogs / RBE // Homemade Mini Corn Dogs + French Fries! 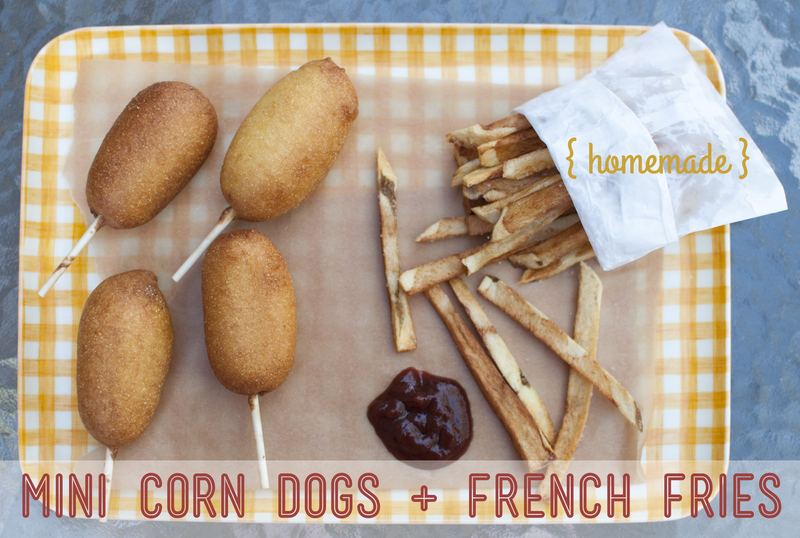 RBE // Homemade Mini Corn Dogs + French Fries! I keep typing the word “homemade,” and it’s beginning to look really strange. Don’t you hate it/get weirded out when that happens? Sheesh. Anyway. That’s right. The roomie and I made homemade (ugh, that word) miniature corn dogs and french fries! We like to try to cook something new every month or two together as a “roommate date.” It’s a lot of fun every time, and this time was no exception. 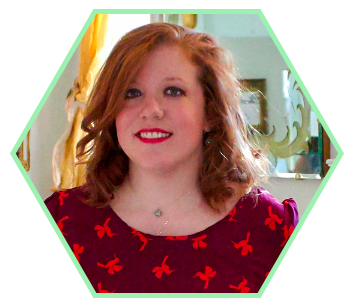 It’s similar to our “RBEs,” – or Roommate Baking Endeavors – except I don’t typically document our dinners on this blog. Well, this time I just had to document it because of how awesome everything turned out. I mean, homemade corn dogs! In miniature form? Who wouldn’t like that?! I might be biased, but they’re so adorable, aren’t they? 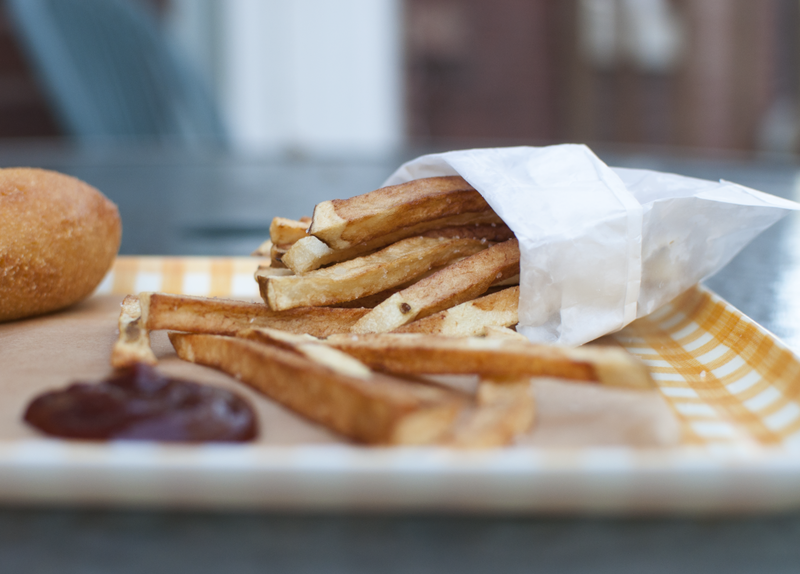 Plus, anyone who doesn’t like fried potatoes is probably crazy and shouldn’t be trusted. Homemade Mini Corn Dogs + French Fries. Yield: About 12-14 mini corn dogs, and fries are enough to serve 2-3 people. We had plenty of food for the three of us, plus a little extra for another friend. 1. Cut each hotdog in half, and insert a lollipop stick into the cut end of each hotdog half. Pat with paper towels, and ensure that the hotdogs are completely dry. 2. In a large bowl, whisk together the dry ingredients: cornmeal, flour, sugar, baking powder, and salt. 3. Add the egg and milk in a liquid measuring cup, and whisk until combined. 4. Next, pour the wet ingredients into the dry ingredients, and using a spoon or spatula, stir until combined. 5. Add about four inches of the oil to a large, heavy-bottomed pot. Attach the deep-fry thermometer to it, and then heat the oil over medium high heat. Heat until the thermometer reaches 360ºF. Line a cookie sheet with paper towels or paper bags and set aside. 6. Dip each hotdog into the batter until it’s coated, then lightly shake off the excess. Lower the corn dog into the hot oil, and fry until golden and crispy, about three minutes. Transfer it to the paper towel/paper bag-lined cookie sheet. 7. Repeat the breading and frying process with the remaining hotdogs. Serve immediately. – Fry only one corn dog at first until you get an idea of what you’re doing, especially if you aren’t experienced with frying food in oil. – Add two or three at a time to fry once you feel comfortable with it. – You can just (carefully) toss the corn dogs into the oil; the lollipop sticks can be fried, so it’s fine if the entire thing is immersed. 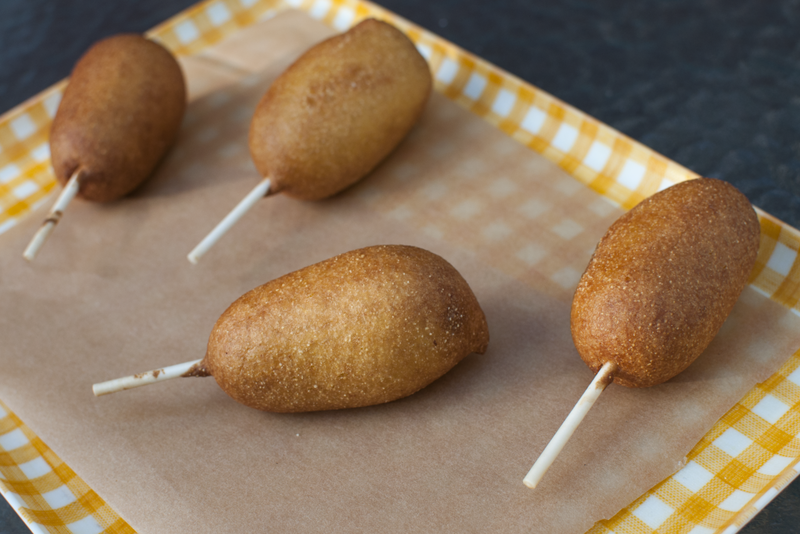 – The corn dogs actually float in the oil pretty well, and they’re “self-correcting.” That is, they pretty much flipped themselves over, ensuring that all sides of the breading were browned evenly. That’s pretty neat! – It’s easiest to dip the hotdogs into the batter when it’s poured into a tall glass. That is, until you get to the end of the batter… Then you might struggle with dipping the last few hotdogs and getting them coated evenly. 1. Wash each potato and peel as much or as little skin off as you’d like. We went the “lazy peeling route,” meaning we peeled most of the skin off, but we were fine with some remaining. 2. Set each potato on the cutting board lengthwise, facing yourself. Slice off about 1/4 inch of the bottom off the potato, in order to create a stable surface. This will help you to continue slicing the potatoes. 3. Slice each potato (with the bottoms sliced off) into 1/4 inch planks. Stack two or three of the planks on top of each other, and then slice them into 1/4 inch “batons,” or strips of potato. Continue until all of the potatoes are sliced into fries. 4. Next, place the fries in a large bowl filled with cold water. This will wash off some of the starches, which prevents the fries from sticking together during frying. 5. Pour one quart of oil into a large, heavy-bottomed pan (or reuse the oil from your corn dogs if you’re doing this all at once like we did!). Heat until the oil reaches about 250º F. In the meantime, line two large baking sheets with several layers of paper towels or paper bags. 6. Once the oil has gotten to 250º, carefully drop small batches of the potatoes into the oil. Gently stir the fries so that they don’t stick together or to the bottom of the pan. Fry them until cooked through, for about 4 to 6 minutes. Remove the fries from the oil and allow to cool on prepared sheets. Continue until all fries are cooked. 7. Allow the fries to cool to room temperature, then heat the same oil to 350º F. Add the once cooked fries to the oil again in small batches. Gently stir until golden brown, for about 3 minutes. Remove from the oil and immediately sprinkle with salt and pepper. Serve immediately. *NOTE: Frying them twice is essential for crispy, typical fries. You fry them twice to cook the starches all the way through, which ensures that they won’t be soggy. + Homemade mini corn dogs recipe from Just a Taste. 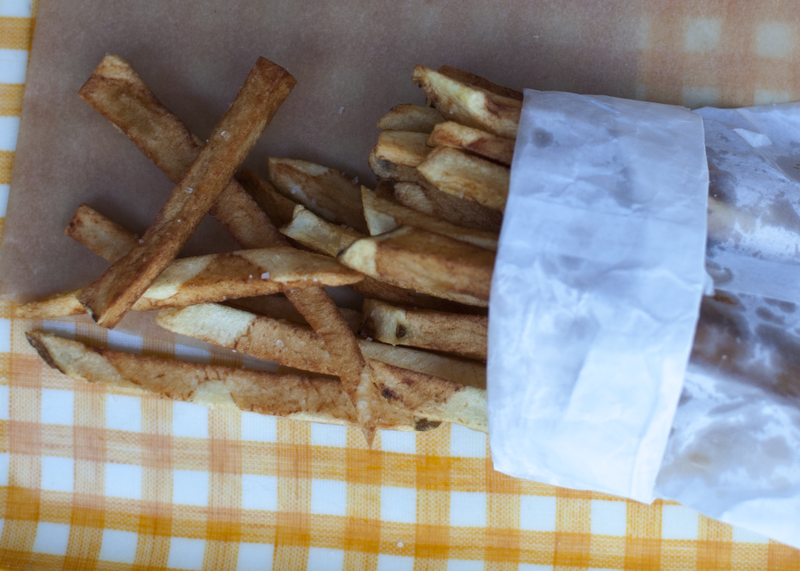 + Homemade French fries recipe from Joy the Baker. These corn dogs are so stinkin’ cute! 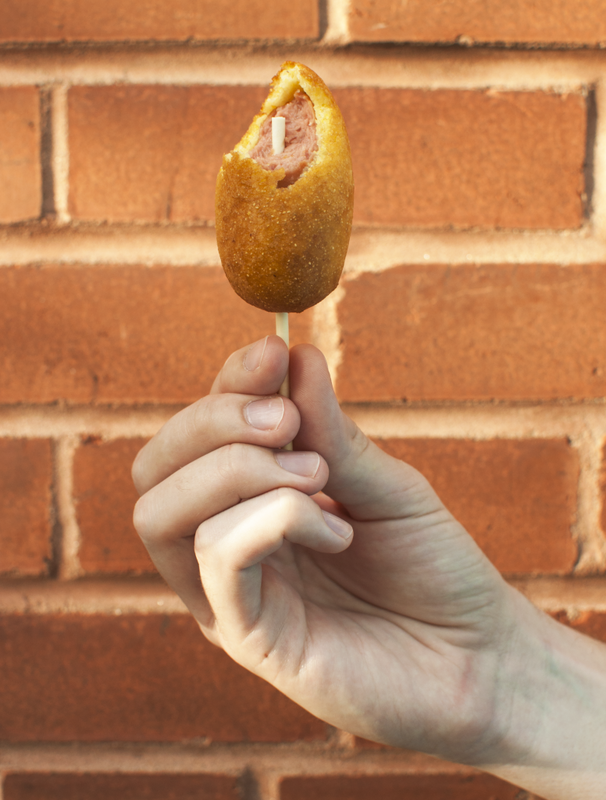 Whenever I see a corn dog, I can not resist ordering one. Thanks for the inspiration.